Recently, a potential adopter came into the shelter where I volunteer, looking to adopt. They had recently lost their kitty and missed him terribly. They fell in love with my current shelter love: a one-eyed Havana Brown with a serious lap fetish! As they chatted, they revealed that they had a love for hard to adopt, special needs cats. (Don't you just love seeing folks like that walk through the door?) The cat they had recently lost had been a hefty lad, weighing in at over 30 pounds. They had worked diligently to help him shed the pounds. Then they mentioned how they lost him: they said he "had developed liver and kidney disease". Warning bells went off in my head. I hate to say this, but odds are that in their attempt to help their beloved cat shed the weight, they may have been the cause of his death. Weight loss in cats should always, always be slow and gradual. A cat's body is extremely efficient. When it receives the signal that it isn't getting the same amount of nutrition it's been used to getting, as is the case in a diet situation, a cat's body will switch over to using stored fat for energy. Sounds great in theory - isn't that what we all want our bodies to do? The problem is, cats aren't build to withstand this. Cats are Obligate Carnivores, which means they need protein, not fat, to survive. When they switch over to burning all that stored fat, kitty's system automatically binds that fat to available protein to process it. But since the cat's not eating and taking in protein, the protein is limited. As it passes through the liver, that's when all that fat that's being "burned" begins to gum up the works. The fat gets trapped in the liver and the liver, in turn, begins to fail. It's a condition called hepatic lipidosis, or fatty liver disease, and it is frequently fatal. Feline obesity is epidemic. 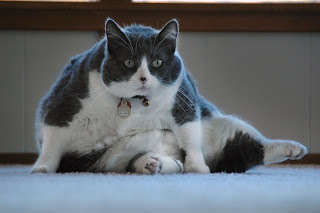 A 2011 study by APOP (Americans for Pet Obesity Prevention) indicated that over 50% of all domestic cats are overweight. And watching your kitty's weight is a good thing, if done properly. Getting your cat to his proper weight will help prevent certain diseases, like diabetes. Overweight kitties often have trouble grooming themselves, and their coats can suffer as a result. All that extra weight isn't good on the joints, either, and can often cause arthritic conditions. And all that fat internally pressing on organs can be a problem - it can affect the lungs and heart, even help cause constipation. But that weight must come off very gradually. If your kitty is "pleasantly plump," check with your vet on the best advised rate of weight loss. Recent studies indicate that a high protein, low carb "Kitty Atkins" diet is very good for your kitty. Translated, that means grain free. This makes sense, since that's the way cats are built: their intestines are much shorter than ours and as such, they aren't able to fully digest plant-based materials and get the nutrients out of them. In other words, they need meat to thrive. And a meat-based, grain free diet will help regulate their blood sugar levels and provide a safe way for them to shed those pounds. And don't forget exercise! 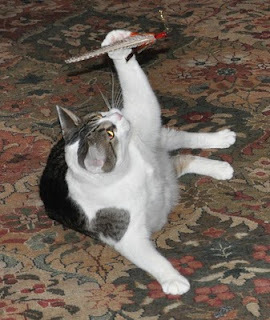 Probably the best way to engage your sedentary housecat into moving to the groove is through a toy that realistically emulates their prey, like Da Bird. What makes this wand toy so irresistible is first, that it uses real bird feathers, so that prey scent is front and center! But what seems to really trip a kitty's trigger is the unique way in which it's attached, to create a fluttering effect. It looks as if the feathers are attached to the string with a fishing lure type of attachment that allows the feathers to spin freely. When you swish Da Bird in the air, unlike other wand toys of its type, this thing appears to flutter and fly. And I haven't seen a cat yet who hasn't gone bonkers over it! As Boris Kitty declares, "Da Bird is Da Word!" We were not in any way compensated for our mention of Da Bird. It's just that good a cat toy! FaRADaY: VEGAN? *shocked look* We're Obligate Carnivores! Me too wish people learned moore things about cat´s before they get one ! Allegra and Ruby go absolutely nuts over the Da Bird. No other toy has held their interest for this long, and consistently. 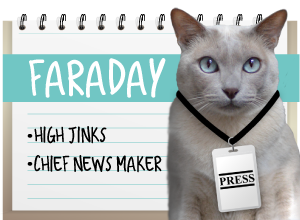 FaRADaY: I totally give it 2 paws WAY up! Oh my it's cute! Thanks for the visit. I've been slowly switching mine over from dry food to canned food, and I will eventually make the switch to grain-free too. Three of my cats are still fairly active, but one (Zelda) is fairly sedentary. She's the one I really need to watch, but they could all benefit from a better diet. Maxwell: Ingrid told Momma today that she's yet to see a kitty on canned grain free get fat. I sense a change in Allie's diet coming up...! Bailey used to weigh 20 lbs. We were told by our vet that if she lost up to 3 lbs in one year, that that was good! Explained everything you mentioned here. Bailey now weighs 14 lbs, yay! The only down side is that she now feels comfortable enough to jump up onto the kitchen counters! Playtime definitely helped, as well as a good food, monitored meals and...well placed bird feeders just outside several windows! FaRADaY: Down side? What down side? Maxwell: That's paweseome, miz Bonnie! Very good post. Austin is lithe (well, skinny) It would be great if he put on a little weight, but I guess that’s the way he is! What a great article! My Mommeh says that since we have been on our raw-food diet, we are so much more active and healthy. I actually used to be able to graze on a big bowl of dry food all day long! Now I have a healthy appetite and cannot wait for my AM and PM feedings! Great post. I want to mention that portion control is also important. None of us kitties here have ever been overweight because we were never fed that much to begin with! Right now, Binga and Boodie get an all-canned, grain-free diet (I am thin and ultra-picky so I get anything I will eat plus an appetite stimulant). For breakfast, they get a 3-oz can split between the two of them. For dinner they get a 6-oz can split between them. That's it! Sometimes a few treats, and Binga steals some of my dinner sometimes. And they are not small cats - Boodie is between 10-11 pounds and Binga is between 9 and 10. And they are quite active and playful even though they are both over 10 years old. I think people don't realize that kitties don't need all that much to eat. FaRADaY: Sparkle, Mommy's glad you mentioned that cuz she was just thinking about this on her way home today. Good point! absolutely GREAT article. THaNK you. I knew most of this, not quite all. I had a feeling right off why their baby had fatty liver disease. Super good article. I hope everyone comes here to read it. 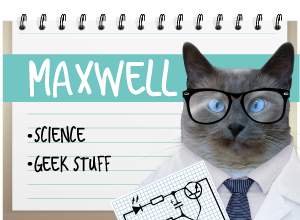 Maxwell: *nods wisely* those warning bells, yes! Gramma had a cat who weighed 25 lbs and TW's friend, the vet tech, would go bonkers if she heard Tym stopped eating for a day b/c of fatty liver disease. That's how we found out about it. I'm still very active so I burn up my food. I've become a very picky eater. I eat half a 3 oz can for breakfast; a 3 oz pouch of grain-free for lunch which I barely lick the soup out of; and a 3 oz can of my favorite Fancy Feast for dindin. Dinner is the only meal where I clean my plate. i also have some crunchies I can nosh on. How much I eat really depends on how much I play. No, I have many wand toys but not DA Bird. We split a 3 oz can in the AM (Maxie gets the juice & Allie & I get the solids) and in the PM. 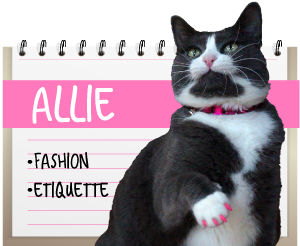 And we nosh on dry in the AM & PM too, but Mommy's trying to get Allie to eat better. She's into JUNK food, Mommy sez. And now she's Infecting Maxie with her Preferences, Mommy sez. And since Allie & Maxie need Weight Control...Mommy's thinking about switching over to wet all the time. We NOMMED a grain free pouch BIG TIME this AM! *highpaw* YUM! Great post! Yes, it's true, weight loss in cats should always be done gradually and with a vet's supervision. One of our cats, who was a little, shall we say, "chubby," had a spell where he lost his normal appetite. The vets were concerned he's develop Fatty Liver Disease that if he did not start eating. Luckily for us, he started eating!